Prayer is a loving exchange with God. When we learn to receive the gift of God’s presence through loving silence, we can develop our personal relationship with Him. One way to receive this gift is through centering prayer, traditionally known as contemplative prayer. This type of prayer enables us to rest in God, leading to a more intimate relationship with Him. Using restorative postures, forward bends, and meditation, this weekend of Yoga taught from a Christian perspective will create an atmosphere for your body and mind to warmly embrace the current season of your life. It will also create an atmosphere for you to genuinely encounter the gift of the practice of peace and rest. Learning how to let your body and mind rest will open the way for a God encounter within the stillness of your own heart. “Surrender your anxiety! Be silent and stop your striving and you will see that I am God“ (Psalm 46:10, TPT). All levels of yoga experience are welcome. The goal of our Christ-centered yoga will be to anchor and quiet the mind so that the body can rest well in meditation and contemplation. Confidence In God is a choice that isn't always easy to make, yet it is imperative to make the choice. It is only then that our true journey towards God can begin. Awareness of the Divine Presence and discernment of God's will are foundational in the spiritual life. Through these principles found in the Christian classic, “Abandonment to Divine Providence,” we will explore the key elements of our pilgrimage. Forgiveness of all is a central challenge of Jesus' ministry. We can often get stuck in anger or resentment. History teaches us that this has led tribes and nations to marginalize, dehumanize, and kill other tribes, nations, and peoples. This retreat will help us own our anger and resentment. While we have no pat answers, Christ is with us to empower us to forgive, to live forgiveness, and thus be the leaven of love to our communities in our modern world. The focus of this retreat is discovering and exploring our images of God and how they affect our prayer. As St. Teresa of Avila learned, discovering the images of God can profoundly affect our prayer life and ultimately our relationship with God. What are emotions? What’s their purpose? The issues we face in our society and the world are becoming increasingly complex and anxiety provoking. The pressures and challenges in our personal lives can compound that anxiety, forcing us to confront our own vulnerability. This retreat will provide tools for both opening ourselves to the Peace That Passes All Understanding -- a Peace that only God can provide -- and for shutting out the noise that blocks us from receiving that Peace. Immediately after the death of Jesus, his followers felt lost, confused, afraid and leaderless, and wondered how they would survive. We too, following a loss, share many of those same feelings and doubts. We too may wonder how we will be able to go on. Many times we have heard the invitation, “Come to me all you who are weary and I will give you rest.” God is waiting and willing to comfort and heal us in our journey of grief. Come rest in his grace. This retreat focuses on what St. Benedict calls the tools of the spiritual craft: various practical ways to follow the lead of the Spirit in the unfolding of a silent loving communion with God beyond the senses, words or rituals. Participants will learn practices to deepen the silence at the bottom of the soul. They will learn skillful ways that deal with harmful thoughts and feelings, the prayer of gratitude, the use of the imagination in praying the Gospels, ways to silence the chatter and commentaries inside the mind, and how to “dance madly backwards” by releasing the power of the Name of Jesus. Prayer is a loving exchange with God. When we learn to receive the gift of God’s presence through loving silence, we are able to develop our personal relationship with Him. One way to receive this gift is through centering prayer, traditionally known as contemplative prayer. This type of prayer enables us to rest in God, leading to a more intimate relationship with Him. In the Passion narratives of the Gospels, we meet three facets of Jesus: (1) Jesus who plumbs the depths of human pain and alienation; (2) Jesus who reaches out to others in concern and forgiveness, even on the road to Calvary; and (3) Jesus who freely lays down His life and embraces death as victory. Contemplating these facets assures us that God is listening, even in our darkest hours of pain, failure, and alienation. We can find God in suffering when we open ourselves to His reconciling compassion and forgiveness. Even the worst evil and distortion in our world have no power over Jesus or those to whom He gives life. Come, join us and enter more deeply into the powerful events that are the very foundation of our Christian lives. On Holy Thursday, we celebrate the gifts of the Eucharist and loving service to one another in the washing of the feet. On Good Friday, we walk with Jesus in His Passion and death. On Holy Saturday, we spend time with Jesus in the silence of the tomb in preparation for the joy of the Resurrection on Easter. God has revealed to us His boundless, merciful love in His Son, Jesus. His heart was broken with love as He wept over a Jerusalem that would later refuse His love, nailing Him to a cross. That cross brings us hope today. The message has rung out through the centuries, yet we have often become deaf to His merciful love. This retreat will focus on how we can receive the healing love, poured out from the radiant heart of our Lord, once we learn to put our trust in Him. Humanity is made in the image and likeness of God. Photography, at its best, can bring to view beautiful images that evoke a powerful sense of God's presence in our world. John Spink, a well-known photographer whose work graces the pages of The Atlanta Journal Constitution, will share his insights and images. Matthew Jeffries is a friend of the monastery and also a professional photographer. He will also share his photographs, many of which are from this area. Fr. James Behrens will lead the retreat and share his photographs and comments on faith and the photographic imagination. In many recent documents, Pope Francis has urgently emphasized that Christians can engage with the contemporary culture and encourage their fellow Christians to celebrate their common communion and responsibilities. These challenges allow them to pray and act for the Church as a whole. 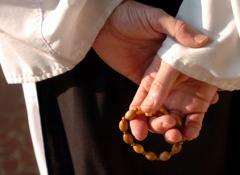 Reflection and prayer on this topic will be part of this meditative retreat. This retreat will explore the importance of Spirituality in the journey of Death and Dying and in the areas of Health Care and Medicine, especially the growing field of Palliative Medicine. Specific topics will include the Spirituality of Death and Dying, decisions around End of Life Care - in the hospital, long-term care facilities, and home settings; Advanced Care Planning, Long-Term Care for Loved Ones, and the growing opportunities to explore ways to participate in God's transforming Love given that a physical death is a reality for all of us. Additional topics will touch on the cultural and religious practices of the Catholic and other Christian faith traditions as well as other religious faith traditions. Using standing postures, hip openers, and meditation, this weekend of Yoga taught from a Christian perspective will strengthen your body, mind and soul connection, creating synchronicity and proper balance. As we nurture and cultivate your body/mind connection, which is vital for accurate self-awareness and true spiritual growth, you will learn to honestly discern what the Holy Spirit is communicating through your body and its five senses. Your faith will grow, establish deeper roots, and become more fruitful. All levels of yoga experience are welcome. The goal of our Christ-centered yoga will be to create a stable and clear mind so that the body and its five senses can discern God’s Spirit working within you. This retreat features twelve key elements of Theresian spirituality presented in the form of a bouquet of a dozen roses just for you. It includes time for presentation, quiet reflection, and discussion. Join us for this delightful shower of roses for your soul! We will show a full-length feature film which carries a redemptive and significant theme. There will be ample time for questions and a discussion. Refreshments will be served - just like in the movies. It will be a worthwhile excursion into the more insightful films of our time. It has often been overlooked that Jesus reaches out repeatedly to women in particular (persons not traditionally considered as disciple-material), letting them know Him in a powerfully personal and life-changing way. Reading and meditating upon such Gospel passages can help us, retreatants - ordinary folks, women and men alike – explore the close personal relationship modeled in Jesus’ encounters with women of diverse circumstances and situations, encounters which show God’s passion for the full human flourishing of all persons. Pondering the most important question in Scripture - Using the prayer of Lectio Divina to encounter Christ and ones'self. The question posed to Jesus and by Jesus in the Gospels leads to a new capacity of life, love, and intimacy in God. Come, join us as we ponder what this question means to each of us today. “Jesus, I trust in you!” So proclaimed Saint Faustina in response to the Divine Mercy. What does it mean to trust in God? How can we learn to trust, especially when life is difficult? How does God help us to have faith in Him? By reflecting on Biblical promises, the Divine Mercy, and the teachings of the great mystic Julian of Norwich, we will pray together and explore how to grow in our faith and trust. Drawing upon the wisdom of the monastery, this four-day retreat will focus on aspects of monastic life that can help busy people who are searching for ways to slow down and pay more attention to the spiritual dimension of their lives. The retreat will include an opportunity to view a documentary film series that captures the impact monastic life had on five women who were struggling with challenges that confront us all. Retreatants will explore how a contemplative approach to life can lead to a deeper understanding of what it means to be attentive to the many ways God is present to us. Practical suggestions for incorporating monastic wisdom into everyday life will be included. Cultural messages tell us we are only as good as others say we are and that can lead to intense personal dissatisfaction. This retreat provides tools for opening ourselves to God's unconditional love and letting go of the negative messages we hear in our heads. God's love for us "just as we are" enables us to embrace our strengths, weaknesses and come to love ourselves. This retreat focuses on learning to listen to God with the ears of our hearts. We will learn how to listen to God speak to us through the Scriptures, how to listen in the monastic tradition (Rule of Benedict), how to listen to conscience, the silence of God, and how to listen to the hearts of our brothers and sisters. Please bring a notebook for journaling. This retreat will focus on “boundary issues.” Do you “invade” other people’s boundaries? Do you allow others to “cross” your boundaries? Boundaries are legitimate, healthy “fences” that we put between ourselves and others in order to maintain healthy relationships. The purposes of having boundaries are to protect and care for ourselves, and respect others, thereby establishing healthy relationships. Social influence occurs when one's emotions, opinions, or behaviors are affected by others. Why do we behave as we do? We aren't always aware of what influences us in different situations. Nevertheless, these powers frequently impact both us and others. During this retreat, we are going to learn to be more aware of our inner emotional responses before they surprise us. Father Shenan J. Boquet travels around the world spreading the Gospel of Life as president of Human Life International (HLI). He was ordained priest in 1993 for the Houma-Thibodaux Roman Catholic Diocese in Louisiana, his home state, where he served before joining HLI in August 2011. Father Boquet has given numerous talks at conferences and symposia in the United States and around the world on issues ranging from the dignity of the human person and the nature of marriage to social justice and moral theology. Explore your connection between the inner life and the written word. This weekend includes time for silence, journaling, and reflection on the relationship between writing and the spiritual life. Suitable for professional and amateur writers at all skill levels, this weekend does not include personal criticism or feedback. Instead, it simply creates a space where you can write, pray, and perhaps even combine the two into a unified spiritual practice. God, the Great Creator, has given each of us unique creative gifts. As children, we are usually attuned to these gifts and practice and celebrate them with ease. In adulthood, however, many of us find that we have put a creative dream or two aside to attend to more practical matters. This retreat will excavate those dreams and maybe even reveal new ones. Using Julia Cameron’s The Artist’s Way: A Spiritual Path to Higher Creativity and the exercises therein, we will work together to break through past creative blocks and generate new visions for ourselves and our work. This inner work helps grow our view of a generous God who invites us, as creative beings, to participate in an ever-unfolding Creation. Are you ready to get on track to better health and wellness? When it comes to your health and wellness, you want the best. The health and wellness retreat will be centered on your personal journey to sustainable well-being, and no two journeys are alike. The way we get you on your path involves focusing on your mind, body, and spirit. The conferences will focus on basic health and wellness tips, developing a personal growth and development plan, the importance of self-care, how to live a balanced life, stress management, mindful living, and how to overcome life challenges. Come join us to learn the steps to achieving optimal health and wellness. Using twisting postures, backbends, and meditation, this weekend of Yoga taught from a Christian perspective will explore the God-designed anatomy of your body and brain. You will experiment with your range of motion and consider the connection between your gut instincts, the desire of God’s heart, and your thinking. Ultimately, you have been designed by Love for Love, and your body/mind connection exists best in the experience of Love. This Love is the plan with which we want to align, and Loving God, self, and others is the connection we desire to establish. All levels of yoga experience are welcome. The goal of our Christ-centered yoga will be to join the body and mind in Love so that your heart can easily be aligned with God’s best plan for your life. How can you love fiercely? Each person may have unique answers to them. This retreat will focus on how the Christ Principle enables us to discover authentic meaning and love within us by using Cistercian practices and charisms to move from self to God. This retreat will show how important these needs are and how we may have them met in legitimate ways that please God. This retreat will explore how the Charisms, such as patience, humility, Liturgy of the Hours, lectio divina, silence, and solitude, that define the life of the monastic community can be readily translated to the lay community. Both monastic and Lay Cistercians will discuss how they live the Charisms in their everyday life. The practice of lectio divina, meaning divine reading, is a form of prayer where one ponders Sacred Scriptures as a means of seeking communion with God. This retreat will discuss the steps of lectio divina and how we can practice this form of prayer in everyday lives as a tool to deepen our relationship with Christ. In life, some fears have to be faced and even embraced if we are to grow and expand. Fear has a good purpose; it protects us from danger. However, it can also keep us from stepping over obstacles that keep us from maturing and living life fully. Once we give in to fears that are based on a lack of self-worth, it can become a habit that can back those afflicted into a very small corner. It is not an easy journey, but one well worth taking. Midlife begs the question, "Is there more to life than this?" This retreat will help us recognize and respond to that deep but subtle longing, and surrender to God's loving call -- a call into ordinary life enriched with love, meaning, and purpose. It is never too late to discover the "more" in life! In the teachings of Jesus, there are prayers, and then prayer---a silent, loving communion with God beyond the senses, words or rituals. We invite retreatants to learn prayer rooted in the Gospels---ancient, proven ways for the most part unknown in our culture. The theme of this retreat is the gradual unfolding of the divine image within us into likeness. Participants will become familiar with the use of the breath and imagination in prayer, and ways to develop interior silence and stillness. We will also present practices to deal with afflictive thoughts and feelings, and the incessant chatter and commentaries inside us that prevent our going deeper into God. As a final word, this retreat longs to help participants to become more of what they already are, living flames of kindness and compassion. A retreat that deals with the need to grow through self-knowledge, and the courage to make that journey. Using gentle inversions, shoulder-openers, and meditation, this weekend of Yoga, taught from a Christian perspective, will focus on the hidden power of the words that you speak and the words that you hear, as well as on the power of the images that you can touch and the images that you create in your mind. We will consider how both these words and visuals yield a harvest. All levels of yoga experience are welcome. The goal of our Christ-centered yoga will be to quiet the mind so that you can easily hear, understand, and respond to God’s truth accurately. We invite people 35 and under to come to this introduction to living with Christ as presented in our monastic tradition. In what ways are you being drawn nearer to Christ? Would you like to know more about his presence in your life? This retreat will include meditations on scripture from some of our Cistercian writers. As we interact with these meditations, we will find ways to open ourselves more fully to Christ. From the Desert Fathers to Julian of Norwich to Thomas Merton, Christian history is filled with stories of men and women who experienced a profound sense of God's presence in their lives. Can the teachings of the mystics still speak to us today? The mystics themselves would say "Yes." Furthermore, their message is not just for priests, monks or nuns, but is indeed meant for the entire people of God. With this in mind, during this weekend we will look at several ways that the wisdom of the Christian mystics can provide insight and inspiration for our age, including the universal call to holiness, St. Paul's directive to "pray without ceasing," and the promise from the Psalms to "Be still and know that I am God." Forgiveness is not forgetting but receiving the gift of inner freedom that enables us to let go of the past and not allow it to define us, our relationships, and our future. This retreat offers tools for experiencing the kind of forgiveness that enables us to forgive others and even one's self -- often the most challenging and necessary form of forgiveness. Practicing the spirituality of thankfulness strengthens our faith, as we remember the evidence of God's presence in our lives. Thank-full-ness encourages others, giving them strength and joy for their journey. This retreat will show how everyone can use the Twelve Steps of AA (Alcoholics Anonymous) in their spiritual lives. The retreat will provide practical ways to use the Twelve Steps as spiritual “tools” on your journey to God.